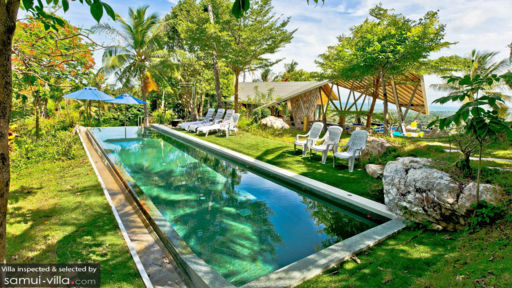 Quartz House in Taling Ngam, Koh Samui is a spectacular holiday home perched atop a mountain with a 360-degree view across the five islands, the splendid ocean, and verdant tropical vegetation. The five-bedroom property is located over a vast land with sprawling gardens perfectly-suited for a small wedding. There are many beautiful sights at the villa including its luscious gardens replete with thriving foliage. The multi-storey house itself has been designed with meticulous detail into interweaving modernity with traditional Thai accents. Indoor living has never so perfectly been entwined with the outdoors. 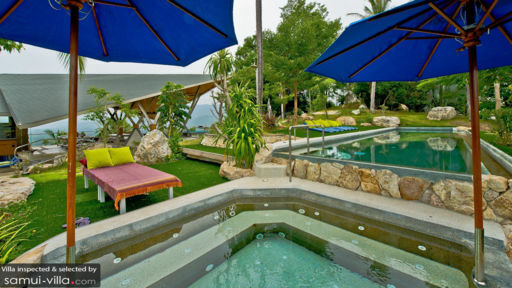 With five bedrooms, Quartz House welcomes large groups of people for a memorable and fun trip to Koh Samui. The bedrooms are furnished with double beds and feature floor-to-ceiling glass windows that offer mesmerizing and breathtaking views of the panorama. With rustic interiors that involve wood-panelled walls, the bedrooms are comfortable and will make you feel right at home. The bedrooms are air-conditioned and equipped with TVs for your entertainment. Each one has an ensuite bathroom with showers, etc. The lush gardens are significant for the view that one can enjoy no matter which direction you turn. The swimming pool is definitely the most refreshing spot at the villa and it is joined by a Jacuzzi which can also serve as a kiddie pool. There are plush daybeds for lounging while sipping on a cocktail. You will find plenty of room to relax outdoors amidst the fresh air and open skies. Indulge in a Thai massage or eat a meal alfresco style to make the most of these surroundings. You can even lie back on a hammock while it gently rocks you to a dreamless slumber. Quartz House is a homey and comfortable villa which has several spaces with sofas, chairs, or daybeds that are great for resting and taking a moment to yourself. 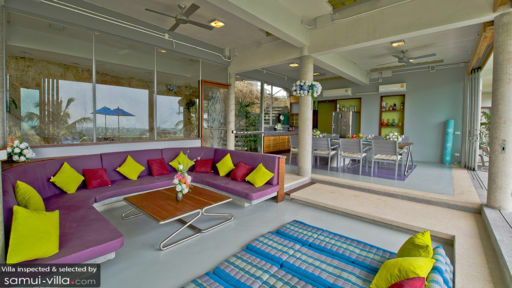 The ground floor of the villa that also provides an ocean view is where the living area is situated. Adjoined to the same is a terrace laid with faux grass to add some character. There are some sofas out on the terrace or you can lounge indoors even while enjoying the view. The asymmetrical ceiling is a striking feature with a wooden inset and you will find everything to be very soothing and calm. There is an indoor dining area overlooking the view adjoined to the terrace with seating for up to ten guests. The villa offers not one but two kitchens to be used by guests either to prepare a meal themselves, some quick bites or beverages, or for meals prepared by a personal chef. You have access to modern amenities such as satellite TV, DVD players, WiFi etc. at the villa. A treat for children and adults alike, from the warm welcome to making sure your stay is smooth and excellent, the staff at Quartz House is there to cater to your every need. Upon request, they can organise private events as well. Although the villa itself is a mountaintop property, a calming and serene location away from all the noise, you can still easily access the main streets in Koh Samui with its famous restaurants serving a mean Thai curry, bars, and the town centre. You can head to one of many beaches in the area or if you’re daring enough visit the snake farm nearby.